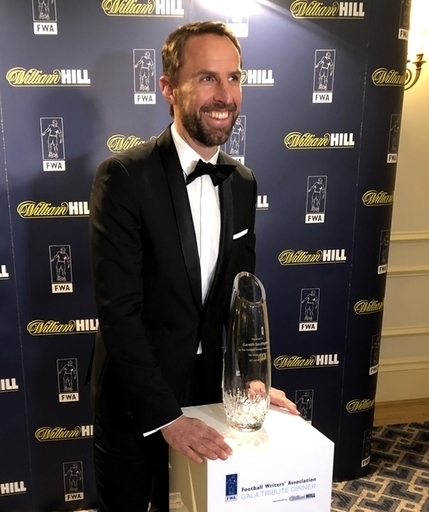 Gareth Southgate became the latest recipient of the FWA Tribute Award at a star-studded ceremony in London's Savoy Hotel on Sunday January 20. The England manager was honoured for leading the Three Lions to the World Cup final last summer, and importantly for helping to reconnect the national team to their fans and the media. Southgate gave a superb speech, thanking the FWA and talking about the work England have yet to do, starting with this summers Nation's League finals in Portugal. He also presented Charlie Sale, who is retiring from the Daily Mail, with the infamous dartboard on which England's players took on the media during the World Cup in Russia. Gary Lineker spoke with great humour and wit about what it is like to be an England captain at a World Cup, carrying the nation's hopes, and he was foillowed by Ben Williams, the former Royal Marines Commando who led England's players and manager through a three-day bootcamp last year. Finally FWA Chairman Patrick Barclay paid tribute to Southgate and introduced a tribute film put together by Gabriel Clarke and Sean Martin of ITV Sport.